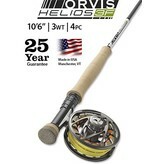 Helios 3F 10'6" 3-wt. Reel seat is type III anodized aluminum Midnight black w/ Matte Storm carbon insert Matte Storm blank Green accent wrap Black/gray main wraps REC recoil snake guides SiC/titanium stripping guides Aluminum rod tube Helios 3F 3-Weight, 10'6" Fly Rods offer enhanced accuracy and feel at mid-range distances. 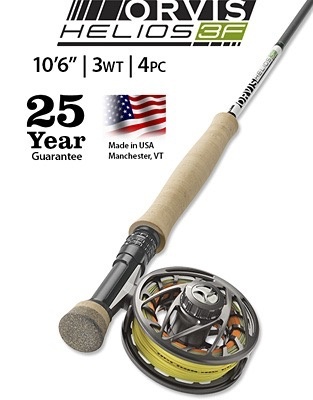 The Helios 3F 1063-4 is an exceptional nymphing rod with the length you need to control your line during longer drifts and the 3F feel and responsiveness to allow you to detect subtle takes. An extraordinarily good rod for tight line nymphing with multiple flies. No cast ever thrown is identical to any other cast ever thrown. The variables of caster, rod, and conditions are too great. Helios 3F was designed to significantly reduce the variables at the point of release focusing the energy of the cast to the intended target. No matter what happens behind you, the energy of the forward cast is crisply released through a tight window created by the most significant reduction in horizontal and vertical tip frequency ever conceived. It is a rifle in a world of muskets and it autocorrects the variables of the cast to the target with incomparable precision.